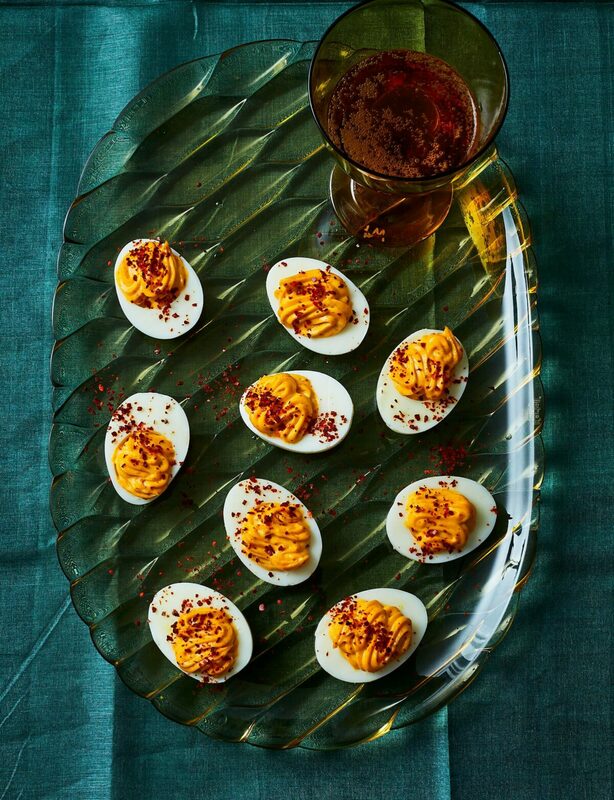 Soulfully spicy harissa and tart vinegar add sass and vibrant color to the gluten free finger food classic. Bring a saucepan of water to a boil. Using a spoon or tongs, carefully lower the eggs into the water. Boil for 8 minutes, then immediately rinse under cold water. When cool enough to handle, gently peel and halve lengthwise. Scoop the yolks into a bowl and reserve the egg whites on a tray. Add the mayonnaise, harissa, and vinegar to the yolks. Using a fork, mash until smooth and very well combined. Using a spoon, evenly fill each egg white half or scrape the yolk mixture into a pastry bag and pipe the filling into the egg white halves. Garnish with red pepper flakes and serve.